on the bottom bit of the telephone there is a little rounded shaped button that hides a secret hidden fingerprint scanner that you can use to scan your wifes fingerprints while she is sleeping at night time to make sure that she is not wanted for any crimes. 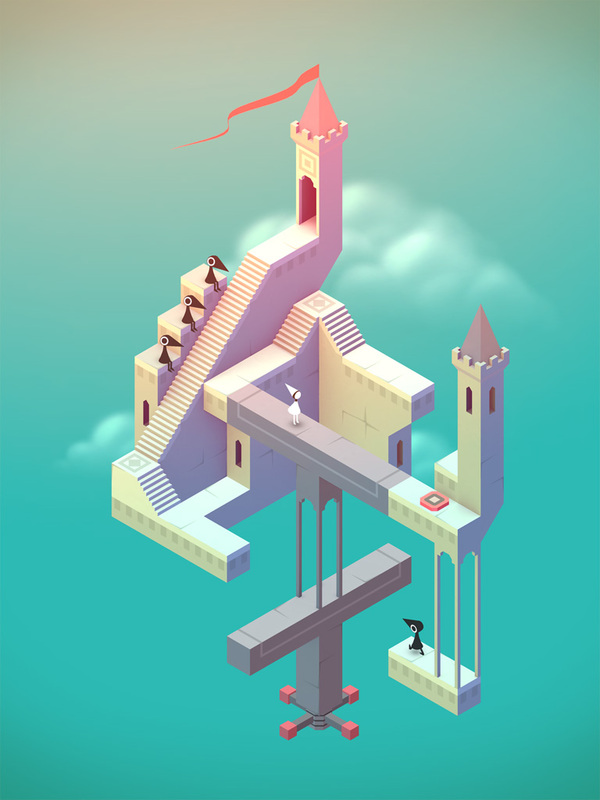 My taste in video games tends to run the gamut from first person shooters to first person shooters, but I was persuaded to give the Apple design award-winning Monument Valley a go. It isn’t very long but it’s very beautiful and genuinely affecting. I think my six-year-old daughter enjoyed it as much as I did. Australian Apple users are encountering a pretty nasty problem: someone has got into their iCloud accounts and is locking them out of their devices. The iCloud hack appears to be a case of people reusing the same passwords, and those passwords somehow falling into the bad guys’ hands – possibly because someone has broken into the user database of some ecommerce site or user forum, or because somebody with access to such a database has sold it on – and that’s enough to enable complete strangers to lock them out of their own hardware and demand a ransom to unlock them again. If your iCloud account doesn’t already use a unique password and two-factor authentication, you could be next. It’s really not okay to pour down personal hate and derision on people who happen to use and like a tech product that competes with the one you prefer. I’m pretty sure that kind of behavior violates the tenets of, you know, all the real religions. And it’s really over the top to become so devoted to a tech company that you can’t see the point of view of others who don’t buy, or even like, that company’s products. Every tech writer is all too familiar with the oft-expressed idea that “the only explanation for a positive review of an Apple product is a payoff”, although I wish it were only limited to Apple things: in my experience, the payoff thing is levelled when you’re positive or critical about pretty much anything. Pointing it out won’t make any difference, of course. As Douglas Adams famously wrote, when people suggest we try being nicer to one another they tend to end up nailed to trees. …until you’ve checked that features you depend upon haven’t been removed. Apple’s done its software thing again: it’s released what’s supposed to be a brand new version of an existing program, but really it’s a brand new program using a familiar name. As this support discussion shows, upgrading to Pages 5.0 means losing a lot of features. And by “a lot”, I mean A LOT. The ones I’ve noticed so far are the removal of the ability to see a character count including spaces (something I need when I write for MacFormat), the removal of the status bar and its persistent word count (something I need in almost every document I do), the removal of the ability to change the default zoom level (again, something I need on each document), the ability to select non-contiguous blocks of text. It doesn’t remember if you close the formatting panel, the Autocorrect preferences are gone, the two-page view is gone, the… you get the idea. Unscrupulous app developers are in the news again today, with parents suffering “bill shock” when the kids buy expensive in-game items without the parents’ permission. There’s a setting in iOS that makes such things possible even if you don’t share your password with your kids, and it’s a good idea to change it. It’s in Settings > General > Restrictions > Allowed Content (I’m assuming you’ve already used Restrictions to set some parental controls; if not, you need to click Enable Restrictions in here). By default In-App Purchases are enabled, and where it says Require Password, the default is 15 minutes. What that means is that if you enter your password to download a free app, the password is then stored for fifteen minutes – and during that period apps can sell expensive in-app purchases without asking for the password. Some kid-targeted apps are well aware of that. The simplest thing to do is to disable in-app purchases altogether, but if you don’t want to do that then you really ought to change the Require Password setting. When I got up this morning, one of my dogs had crapped on the kitchen floor, my mobile was showing No Service and the coffee machine spat out hot water instead of coffee. Giant mutant bats from the planet Thargle, which I’ve just invented, mean that Apple is dooooomed! You see exactly the same in music (“Our album’s going to be so much better than theirs“), and in boxing (“I am really good at punching people, and he isn’t”), and in supermarkets (“We’re cheaper than them, and our food isn’t made of horse!”). My daughter’s been using gadgets since she was two. Kids’ ebooks from the likes of Oliver Jeffers and Nosy Crow are wonderful things. We’re using apps such as Mathboard to help her learn arithmetic. We have dozens of great apps for kids that enable her to do arty, crafty things without getting paint, glue or glitter on the dogs. We use Google Image Search to find pictures of things she wants to know about. She records her own voiceovers for talking books. It’s part of a wider mix that involves stacks of books, real-world arts and crafts, day trips to interesting places, nightly question and answer sessions and lots of conversations, and if from time to time she wants to watch Fairly Odd Parents on Netflix when I’m making the dinner then that’s fine by me. My iPhone 5 is much quieter than previous iPhones, and that’s a problem: a lot of the music I listen to is quiet, or unmixed and uncompressed, and that means it isn’t loud enough when I’m on the bus. If you’re suffering from the same problem, there is an easy and free way to solve it. Step one: download Denon Audio from the App Store and use it instead of the default Music app. 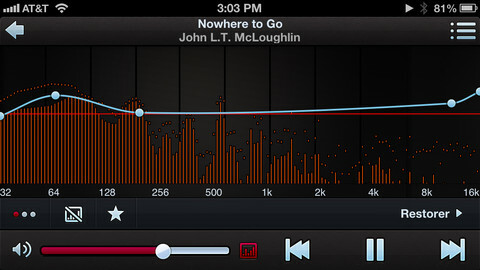 Step two: in the EQ view (shown here), click on the settings icon in the top right hand corner. Step three: choose the Flat EQ option. Step four: you should now see a single straight line with two points, one on either side. Drag one of them upwards, then drag the other one up to the same point.That boosts the volume of everything without changing the sound, although of course you can create a custom EQ if you want to do that. If the limiter option is on (it’s in the Settings screen, and enabled by default) then even if you turn it up too loud you won’t get horrible clipping distortion. Step five: there is no step five. Hurrah!